I have to be brutally honest with myself. I’m not very good at interpreting films. I’ve been watching movies for most of my 41 years, and doing so intensely for the past decade. I am little better at film analysis now than I was as a child consuming The Muppet Movie for the umpteenth time. I can fake it a bit, throw around some half-understood terms that I’ve picked up here and there. While Stalker isn’t as impenetrable as The Mirror, I’d still have a pretty tough time putting together all my thoughts on it, merging them into a unified, well-reasoned analysis. It would be more random, piecemeal bits that only scratch the surface… bits about the film’s sideways look at religion, how the Stalker is a shepherd but one whose own faith is tinged by doubt. How the characters struggle with reason versus faith, how their journey is more interior than anything else (and how the journey must be difficult). How we see little that substantiates the Stalker’s claims of the Zone’s rules and perils, he must be taken at his word. I could maybe toss out a tidbit about the movie’s political messages, the oppressive, militant government that restricts access to the Zone, the nuclear cooling towers that loom in the background of a particular shot. You see? Random, fleeting bits. I’m not good at this. I don’t have the patience and I probably don’t have the smarts. For in-depth analysis of Stalker, you’ll have to look elsewhere. I recommend this fine piece by Murtaza Ali over at “A Potpourri of Vestiges” as a good starting point. While I do have some intellectual reactions to the film (that I am unable to articulate), it’s more about the experience for me. I love a movie that just washes over me and immerses me in its essence. And from the first moments, Tarkovsky draws you in and holds you. Such masterful cinematography, both in the sepia-toned segments of the outside world and the color of the Zone. Those amazing locations presented in all their beautiful, decrepit glory. 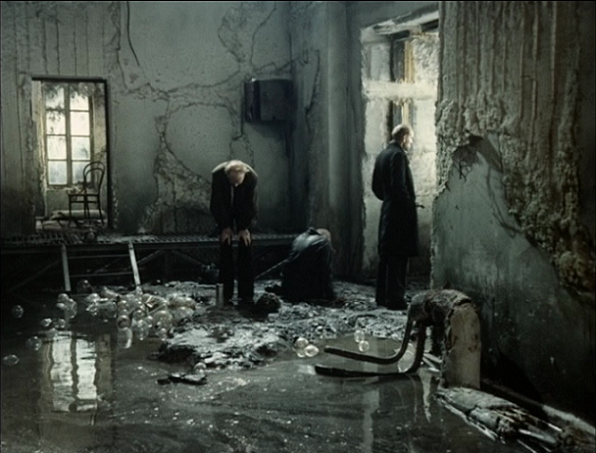 The textures are endlessly fascinating, like those of Tarr (who undoubtedly was inspired by Tarkovsky). It’s not just the glorious parade of stunning images, though. The lush, dense sound design and occasional otherworldly score greatly adds to the immersion. The journey — both through the Zone and through the soul — is shared generously with the viewer. The performances by the three travelers are rich as well. The Stalker (Aleksandr Kaydanovskiy), who seems so confident and yet it so shaken the deeper he gets into the Zone. His speech about how weakness is the ideal rings throughout his performance. You rarely see a “leader” so fragile. The Professor (Nikolay Grinko), skeptical but loyal to the Stalker… despite his own secret agenda. And the Writer (Anatoly Solonitsyn), who gets what may be the best speech in the film, about the doubt that drives his craft, and how can you write if you have nothing to prove? This entry was posted on January 12, 2013 at 3:16 pm	and is filed under Movie Reviews. You can follow any responses to this entry through the RSS 2.0 feed. You can leave a response, or trackback from your own site. I think (although I haven’t seen all his work and need to rewatch those I have seen) that this is my favorite of Tarkovsky’s films. It took me three tries to properly get through it, but I think that may have been for the best…it’s a film that demands a lot from the viewer, but if you meet those demands…it offers so much in return. And it’s so beautifully made in every way, and the ending is so powerful–enigmatic, but in the best way possible. It really deserves to be part of the canon. It’s definitely my favorite (though there are others I need to revisit) and I hope a Blu-Ray comes soon.